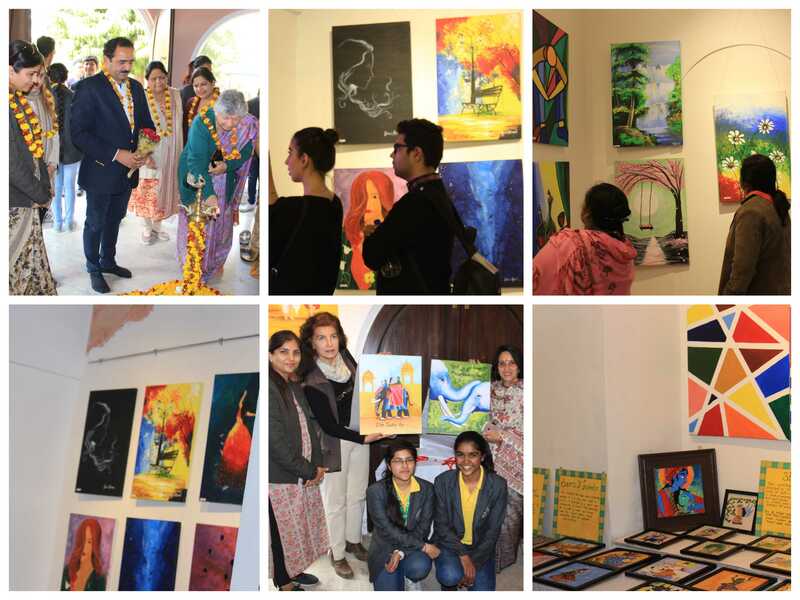 St. Edmunds school organized Euphoria 2019, its 6th annual art exhibition, at The City Palace (Maharaj Swai Man Singh Museum II, Art gallery)on 4th &5th February 2019. The exhibition was inaugurated by Dr Surendra Soni, the Secretary of Rajasthan Lalit Kala Academy& the Guest of Honor was Ms Rama Dutt executive trustee of Sawai Man Singh Museum II. Edmundites experimented with shape, colour and texture while creating still lives and interior designs. The exhibits incorporated different subjects of paintings such as nature, mythology, fantasy, daily life, Buddha and sculpture. What made their artwork unique was the students' confidence in their individual expression. The main objective of this exhibition was to showcase each student’s expression of their creativity. On 5th Feb renowned guest Ms Brigitte Uttar Kornetzky’s director of the documentary film “where Elephants Sleeps”& Mr Sandeep Sethi Former Director Education officer CBSE also appreciated the work of students. The exhibition included a live demo by Edmundites on charcoal art, soft pastel and portrait making which provided a platform for budding artists to showcase their skills. The beautiful artwork made by Kaynat, Vishakha, Jaishree, Aanchal, Ritu, Nishita , Manaya , Shumila, Khushi, Harsh, Aakansha got an overwhelming response by guest artists and left spectators mesmerized. The School Joint Director Dr Pooja Singh & Principal Mrs Anu Bhatia and the guests applauded the artwork of the future artists, which made the event a huge success. As we all know planning is important in every field and when it comes to our kid’s future it is the most important thing which every parent must have to consider. It is the responsibility of a parent to guide their kids for better education and development every time when they need. Nowadays parents are very much concern about their kid's education they select the best school for their children. Enrolling your kids in Private schools in Jaipur is one of the best options to improve their talent and skills. St Edmunds school Jaipur is a well-known school knows for its best learning environment. The school was established in 1975, located in Jaipur, Rajasthan with the motive to provide high-class education to every student who became the part of a school. For better education, there is a requirement of better instructors and we are proud to say that we have best teachers and students apart who has withstood with us in providing quality education. Indeed it is the quality of hard work and education provides by our professional and a highly qualified teacher which makes us stand among Best schools in Jaipur. Saint Edmund’s is a co-educational day school offers the best educational environment to the child which help them to learn easily and more properly. Listed as one of the best CBSE schools in Jaipur, it is our responsibility to work hard for the betterment of every child future. While enrolling your child in any Schools in India, parents must have to consider few things like academics, learning environment, safety aspects, teaching staff, sports activities and many more. Finding Good schools in Jaipur for your ward is not an easy task, choosing a right private school every parent has to pass through the much hard process. St. Edmunds is the best play school in Jaipur, where teachers show their constant initiatives towards providing valuable education to make the future of their students bright. The school provides the best infrastructure and excellent learning facilities to our students. It is our earnest desire to provide quality education and educational growth to our students. We stand as a best play group school in Jaipur, which itself shows our encouragement towards hard work. We have most qualified Montessori trained teachers who know how to treat a child. We believe in play while learn that’s why we have different aspects and ideas to nurture our every kid. Choosing a right Nursery school in Jaipur for your child not only helps him to get the better education but it will also improve their physical abilities. So, now is the time to take out the list of CBSE schools in Jaipur, where the focus is given on both, physical abilities as well as on mental strength. St. Edmunds School is listed under top 10 schools in Jaipur, provide effective teaching to your children which helps them to enhance their skills. The skilled instructors believe in learning and growth of every student and make them enough capable to set the high standard of achievements. “Our student's achievements are best award for us”.